The London 2012 Olympics are just around 400 days away and each World Cup brings Mariel Zagunis that much closer to the Olympic world stage. This New York World Cup is the only Olympic qualifying event that will be held in the United States so to support and promote Mariel and Team USA, we’re giving away Mariel’s signature towel every day this week along with a fun grand prize. So let’s get warmed up with any easy question to start the week. Question of the day: What is the name of Mariel’s fencing club? 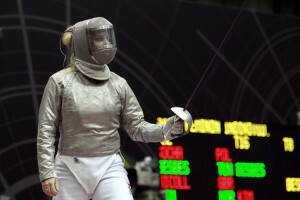 Mariel’s club is the the Oregon Fencing Alliance.